Barbara Ernst Prey ’79—whose watercolor paintings hang in private and public collections including the White House and NASA headquarters—was commissioned to paint Massachusetts Museum of Contemporary Arts’ Building 6 ahead of its opening this month. 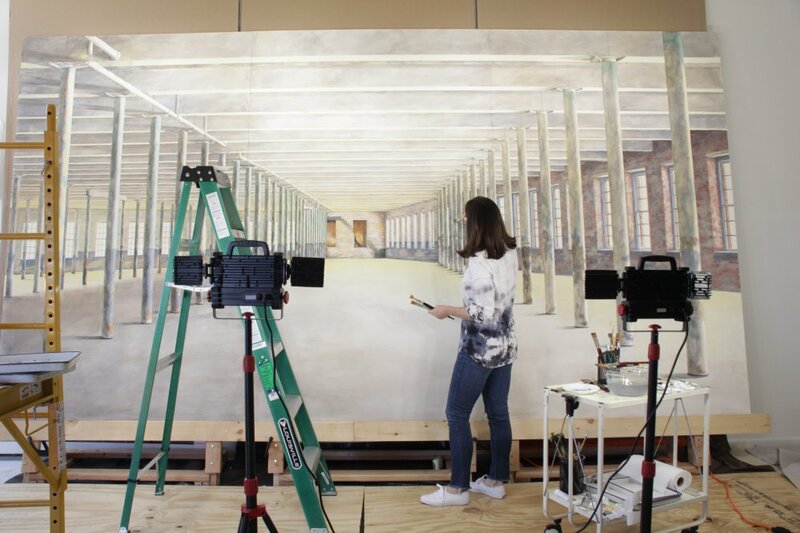 The painting, which depicts the interior of the building before it was renovated into gallery space, measures 9 by 16 feet, making it one of the largest watercolor paintings in the world. “The biggest challenge was finding big enough paper,” says Prey, who eventually found high quality paper stock in England that came in huge rolls. She mounted three panels onto a wood base in order to create a working surface that would not warp with either the humidity in Williamstown—where she painted the piece over the last nine months—or the paint itself. In order to minimize dripping, which can’t be hidden or painted over in watercolor, Prey leaned the mounted paper at a slight angle as she worked in her studio. “If you look closely, you can see a few drips,” Prey says. The project was a homecoming for the artist, who studied art history and Baroque architecture under long-time art professor S. Lane Faison Jr. ’29. Prey says Faison continued to mentor her after she graduated from Williams. “I visited Lane once, and he said he wanted to show me something,” Prey says. “He took me inside the old Sprague electric building—which was completely empty—and said ‘Just look at this space.’” The pair that had studied and written together about German Baroque architecture couldn’t get enough of the old factory building, imagining what it would become. Of course, it became MASS MoCA, one of the largest museums of contemporary art in the country. “Being asked to return to MASS MoCA to paint the interior of this building, after studying art and architecture with Lane, who was the first person to show me the building, feels like a wonderful coming together of all the threads of my life,” Prey says. Building 6 opens May 29 and features work from artists Laurie Anderson, Louise Bourgeois, Jenny Holzer, Gunnar Schonbeck, Robert Rauschenberg and James Turrell. Prey’s painting will hang in the entryway of the second floor, where it will help visitors imagine how the space looked before it was renovated. Read more about the opening of Building 6 and Prey’s artwork. Barbara Ernst Prey super-sizes watercolor, a medium often reserved for smaller works, for MassMoCA’s new wing Building 6. When Mass MoCA asked watercolorist Barbara Ernst Prey to capture on canvas the pre-renovation state of its new wing, Building 6, for the space’s opening, Prey thought such a big event deserved a painting of equal magnitude. The result is her largest work to date, 8 feet by 15 feet, taking a year and a half to complete. It’s certainly huge, but the work is just as much about her relationship with Mass MoCA. In her student days at Williams College, where she is currently an adjunct professor, her teacher and mentor, S. Lane Faison, took her on a tour of the space that would become the museum, which Prey now sees as bringing her full circle. Prey grew up in an art studio. Her mother was head of the Pratt Institute design department and Prey started painting as a small child alongside her mother. She’s since had work commissioned by NASA and for the 2003 White House Christmas card, but the Building 6 painting truly kept her on her feet, both figuratively and literally. This came after a significant time just planning the work, which the scope of the work demanded. Merely tracking down a source for oversized watercolor paper took time and Prey had to figure out positioning such a large piece at an angle to prevent drips, while at the same time working from a ladder and scaffolding. Prey started the process with nearly 50 on-site color studies. She continued work in her New York studio but moved everything to her Williamstown studio to be physically closer to the space. The final work also features experimentation of material not often found in watercolors—dust, dirt, and paint chips from the space embedded in the painting. PORT CLYDE — Barbara Prey has a golden resume: a bachelor’s degree from Williams College, a master’s from Harvard and a Fulbright scholarship, which she used to study baroque art and architecture in Germany. One of her first jobs was drawing illustrations for the New Yorker. Her watercolors have been used for two White House Christmas cards, and her paintings are in the collections of the Smithsonian American Art Museum and Brooklyn Museum and hang in U.S. embassies around the world. Barbara Prey’s studies of her painting, which was commissioned by MASS MoCA, are on display in Port Clyde. But for all her accomplishments, Prey, who lives part of the year in Maine, has lacked an enthusiastic endorsement from a leading contemporary art museum. That changed recently, when the Massachusetts Museum of Contemporary Art in North Adams commissioned her to make what the museum believes is the largest existing watercolor painting. MASS MoCA, the country’s largest contemporary art museum, after its recent expansion, and a taste-maker in contemporary art since it opened in 1999, challenged Prey, a landscape painter in the tradition of Andrew Wyeth, to make a large-scale painting showing the museum’s new home in a former mill complex before a renovation and expansion added 120,000 square feet. The museum wanted to document the mill while the patina of the peeling paint and unfinished wood floors were intact. Prey gave them “MASS MoCA Building 6,” which preserves the former factory in its raw state, with dusty floors and red-brick walls. Unframed, the painting is 8-by-15 feet. Prey used three 8-by-5 sheets of paper. Framed, it’s a foot larger in each dimension and weighs about 300 pounds. If there are bigger watercolor paintings out there, the museum can’t find them, said director Joe Thompson. Thompson suggested the project to Prey, because of his personal admiration of watercolorists who “achieve a frictionless ease” in their paintings, and he puts Prey at the top of his list. At a Berkshires cocktail party a few years ago, he challenged her to blow up the scale and try something really big. “I asked her almost as a coy joke, and she just sort of laughed. As is her way, she leapt at the challenge,” Thompson said. 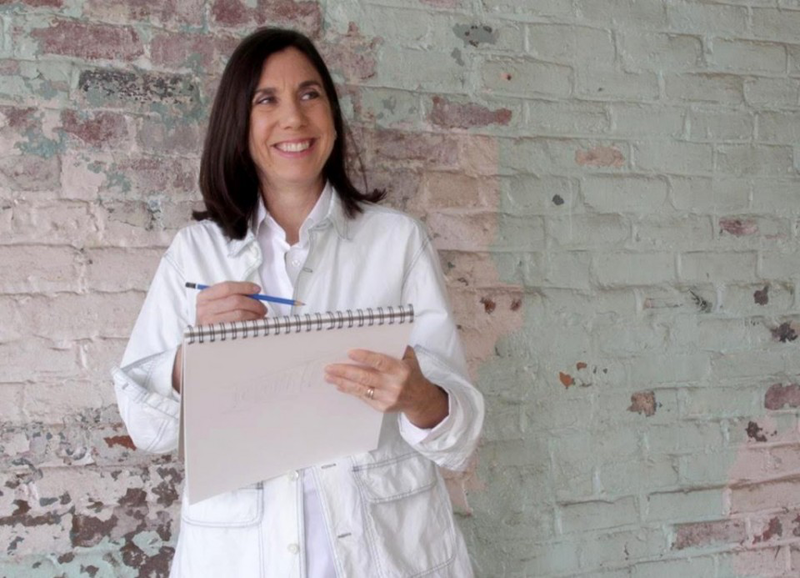 She proposed an interior portrait of the building, drawing on her interest in architecture that began in college and has resurfaced throughout her career, including in a series of interiors of Maine meetinghouses that she did after Sept. 11. As old New England mills are, the space is huge. The second floor, on which the painting is based, is more than an acre, with 400 columns and hundreds of windows. There are layers of paint and decades of grime. It was a textile mill and an electronic component plant before becoming a cultural destination. The painting was unveiled when the new space opened in the spring and is hanging in the prowlike atrium of the new Robert W. Wilson Building, along with art by leading contemporary women artists Jenny Holzer, Louise Bourgeois and Laurie Anderson. While the large-scale original will hang for up to three years in Massachusetts, Prey is showing a dozen pencil drawings and watercolor sketches of the MASS MoCA commission through Sept. 20 at her gallery in Port Clyde, along with the colorful, representational paintings of the Maine coast that have made her popular with presidents, actors and everyday Mainers. One of the paintings on view in Maine is her final study for the interior mill space, about 24-by-40 inches. A column study of the mill space. The horizontal painting shows the empty mill, floor to ceiling, looking between two rows of descending columns, which dwindle in size and create the perspective of a vast, open plain of space. Windows along the brick walls flood the surface with light. Her biggest challenge was keeping plumb the drawn lines of the windows and columns to achieve the perspective of looking through space. Prey, who has been painting more than four decades, witnessed the transformation of the mill from the time she was a student at Williams College in nearby Williamstown. She has stayed connected to the community as an adjust faculty member at Williams and by maintaining a studio in Williamstown. It was there she did most of the work on the painting, because the proximity allowed her to travel between her studio and museum during the renovation to sketch, monitor the light and check other details of the space as it was being transformed. “It was disappearing as I was painting it,” she said. Her early research was technical – where to buy paper for a painting this large, what kind of paint to use, what kind of brushes. After sketching and drawing, she spent six to eight months painting, first at her studio on Long Island, New York, where she lives most of the year and returned to after leaving Maine last fall, and later in western Massachusetts, where she spent most of the winter and spring. She completed the painting in April. To make a detailed painting so large, she treated it as a series of small paintings, concentrating on a section at a time. Because watercolors are unforgiving and dry quickly, she had to plan and test nearly every aspect of the painting ahead of time. She made several mistakes. She used a shade of red for her bricks that brought unexpected results. Early on, she represented the wood floor by drawing lines, and later changed her mind. And on her final day of painting – one of her final acts – she knocked over a jar of brushes and water, spilling both from her scaffolding onto a section of the paper’s finished surface, discoloring it and gouging it. 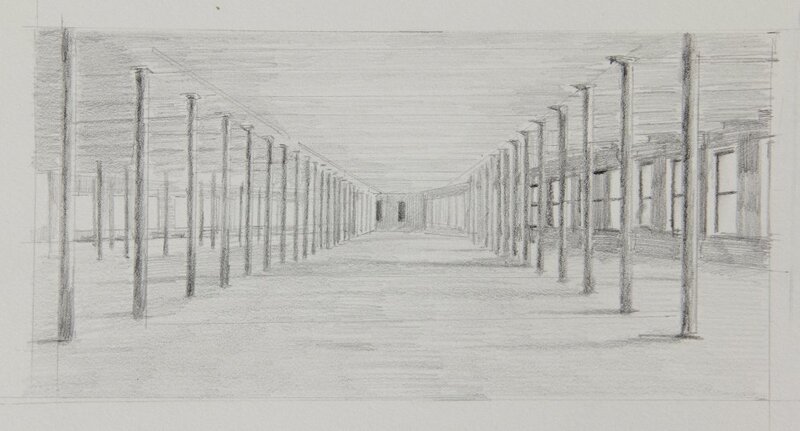 A pencil study of the old mill which, once renovated and expanded, became the new home to MASS MoCA. The second floor, on which Prey’s painting is based, is more than an acre in size, with 400 columns and hundreds of windows. She was able to fix each of those errors – by quickly brushing out the offending red, spending three days erasing the lines on the floor and blotting the water and brush marks before they dried. Prey has operated a gallery on the St. George peninsula every summer for most of 40 years, usually featuring her colorful, representational watercolors of the region’s shingled homes, rugged dories and stout spruce trees. With her work, she attempts to capture the evolving culture of Port Clyde and the surrounding fishing communities, by observing and recording. She does much the same with her painting at the mill. Prey, 60, is thrilled be a part of the contemporary art conversation and hopes “MASS MoCA Building 6” elevates her stature from a successful watercolor painter to an influential one. Having one of her pieces on view alongside Jenny Holzer, Robert Rauschenberg and other heavyweights of contemporary art can only help, she said.